Men and women surrounded my car when I stopped at the junction of Dindivanam, Tamil Nadu. I was driving from Chennai to my native village near Cuddalore. Packets of either roasted ground nuts, ginger candy, samosas or masala vadais were nestled in their blue plastic tub. They ran towards the Government buses even before they had rolled to a complete stop and screamed with their boisterous voice at the passengers to buy their eatables. "Amma, vangiko ma, nallu vadai rendu rubha dhan ma!" (Madam, please buy, just Rs.2 for 4 vadais). Their torsos pressed against my car doors and their voices echoed around the mid-afternoon humid air. I nodded my head as a denial. Even when the heart craves to take a bite of those street foods, the brain pops mid way to remind that no eating foods sold outdoors. As I rolled down my car window, a women in mid- twenties, came running with a basket of vellarikai (cucumbers) and nongu (palm fruit), placed in a plastic bucket of crushed ice. I bought few mini cucumbers and a nongu bunch, sufficient enough to munch till my next stop - Pondicherry. I had just drove past the Gandhi statue, placed at the center of the Pondicherry's beach road and entered the lane of Sri Aurobindo Ashram. Everytime I visit my grandparents, it's a habit to stop at the Ashram for a short prayer. I just love the unruffled and serene ambiance and wouldn't mind to sit next to the samadhi for an entire day. I came out of the ashram after a quick prayer and a thirsty throat. I wore my sandals and headed straight to cradle myself with a healthy beverage. At a stone's throw distance, there was a coconut vendor. I ordered one. With a razor sharp rustic aruval (sickle-sword), he made a quick slash three times and handed the nut with a plastic drinking straw. Sweet tender coconut gushed through my throat and I asked him to chop the drained nut into half . With a whack at its corner, he made a biodegradable spoon out of the coconut shell and scooped the white-jelly meat out. I relished the cold, sweet and sloppy flesh. It was 4.00PM by then. Time to start as there will be four anxious eyes waiting for my arrival. Garlic and onions growling in the vegetable oil filled the kitchen air with its scent. The smell of the deep fried patties traveled from the volcanic-hot kadai to the dining room to the living room to the outside garage. Molecules of masala vadai were floating like the specks of saw dust in the air.The seducing aroma of cilantro, garlic, lentils entered my nostrils and I was ravenous. I waved my hand to my granddad and he announced to my achi that I arrived. She came with a tray loaded with home made sweets, masala vadai and pipping hot tea. Wash the gram dhal in running water and soak in 4-5cups water for 1-2 hours. Once done, drain the water and grind them to a coarse paste with ginger, garlic, coconut, green chilly, dry red chilly, fennel seeds. Add very little water to grind. We are looking for a very thick batter (Check the picture below to understand the texture of the batter). Mix in the raw onions, cilantro, curry leaves, garlic skin and salt. Check for salt before frying. Heat the oil to 350'F . Clean your hands and dry it with a kitchen towel. Wet your hands with olive oil / cooking oil to get a good shaped patty. Remove a little batter with a spoon or a small ice cream scoop and press it against your left palm with your right hand fingers to form a patty (about 1-2cm radius). Slide them into the hot oil and cook till they turn brown and crispy. The 2nd Annual San Francisco Food Blogger's Charity Bake Sale is happening on the 14th May 2011. Funds raised through the Food Blogger Bake Sale support Share Our Strength’s efforts to end childhood hunger in America. Nearly one in four—children in America face hunger, that’s more than 17 million kids!! If you love to bake, join us for this noble cause. 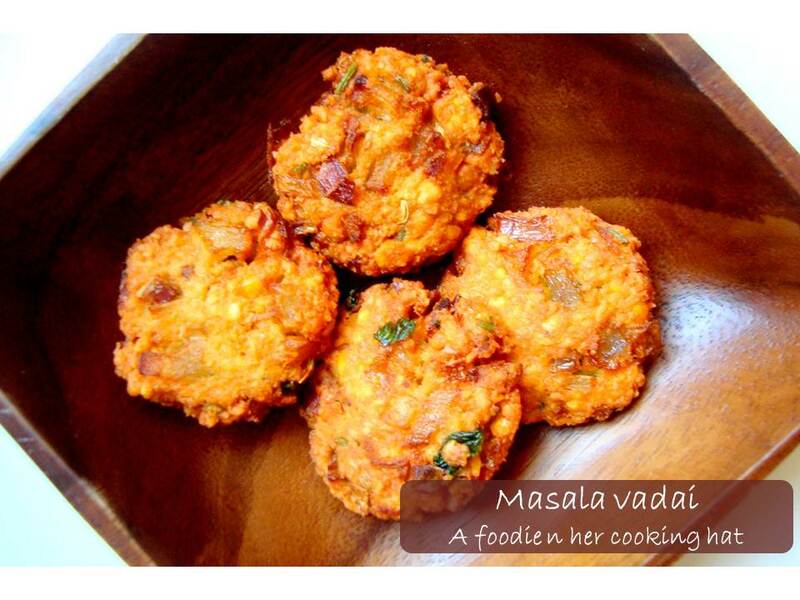 Super crispy and super yum looking vadais! 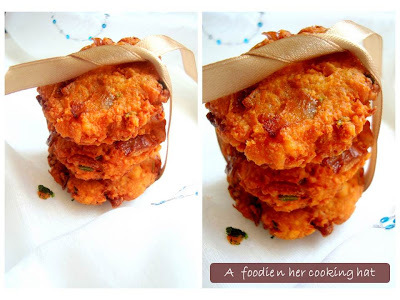 Feel like gobbing some, masala vadai looks marvelous and inviting..
Wonderful,u write so well :) Vada looks so appealing and love the colour too! 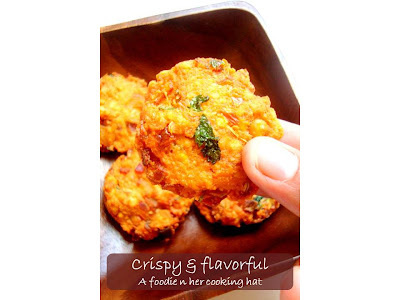 Crispy vadas looks yummy and marvellous, feel like munching some..
wow..masala vada looks crispy and very very delicious...feel like grabbing one from the screen..
yummy vadas...crispy and crunchy!....love to have some now! o yummmmmm it looks ! Ur description of the trip to cuddalore took me to my childhood vacation days.. esp the dindivanam bus stop is so truly described.. and madam, u r one person i know who can transfer things as simple as masala vadai into 'heavenly feast' like looks.. with ribbons and wooden bowl effects.. yummy..